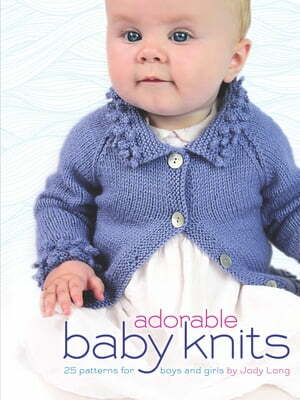 Collins Booksellers - Adorable Baby Knits by Jody Long, 9780486817767. Buy this book online. Intermediate to advanced knitters will adore these original designs, which offer a modern take on classic infant knitwear. Twenty-five patterns, arranged by skill level, include booties and matching hats, blankets, a vest, and a dress as well as a generous selection of sweaters, cardigans, and coats. The patterns incorporate cables, lace, bobbles, color work, and a variety of other techniques that lend a distinctive charm to each item. All projects feature clear directions as well as charts, schematics, and color photos. Projects include booties in fisherman's rib and seed stitches, rainbow booties with matching hat, flower picot and frilly sun hats, and blankets with teddy bear and rosette motifs. Sweaters range from sheep, daisy, and nautical styles to swing, fringed, and loop stitch cardigans. Other patterns include an easy henley, zigzag bolero, peplum coat, moss stitch duffle coat, cabled vest and pullover, lace and seed stitch dress, and more. An ideal source of fresh ideas and personalized presents, this book is also a great gift for anyone with a knack for knitting.